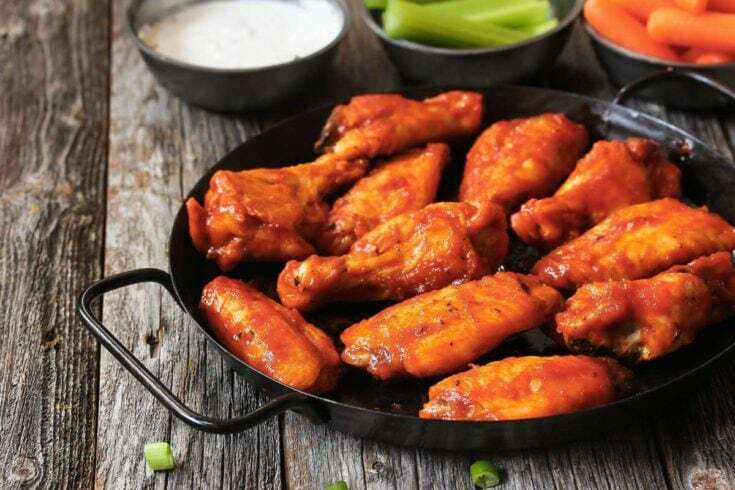 Is there a more classic game day dish than Buffalo wings? Maybe football season should be called wing season. I love Buffalo sauce so much, I think I could eat it on just about anything. Every football season, I make Buffalo wings for at least one or two watch parties, and they tend to disappear fast off a buffet table. Most restaurants fry their wings to get them crispy, but if you know a few secrets, baked Buffalo wings can be even better than fried. This recipe is a follow-up to my Baked Honey Barbecue Wings. The method for both recipes is the same – only the sauce is different. When I make wings, I usually make half Buffalo and half barbecue. If I had to choose one or the other, though, I would choose Buffalo every time. To get crispy wings, you need to cook them long enough to render most of the fat out of the skin, but not so long that they dry out. 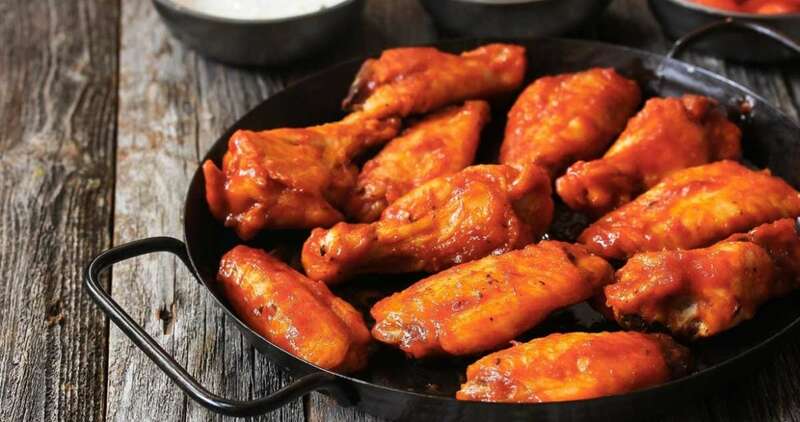 There’s nothing worse than soggy skin on Buffalo wings. Recently I was at one of those chain wing restaurants, and our wings were underdone with soggy, fatty skin on them. Not appetizing. 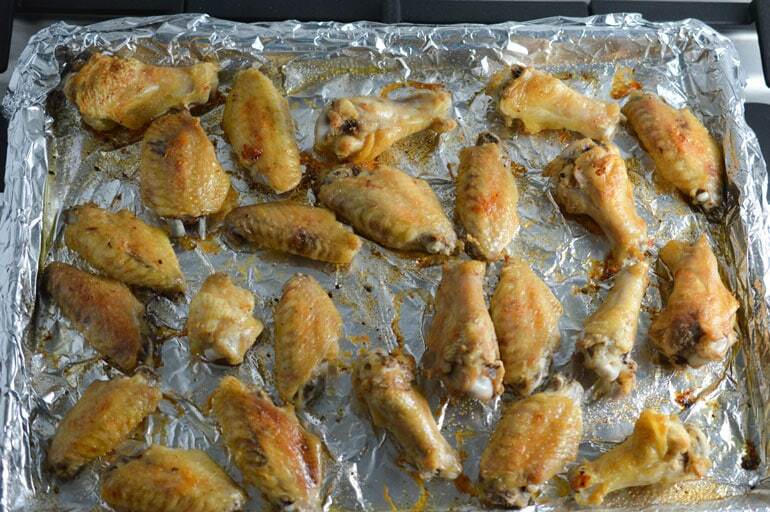 If you want your wings to be crispy but not dry, the secret is to parboil them first. It might seem weird, but this step helps get rid of some of the fat you don’t want. Place the wing segments in a big pot of boiling, salted water, and bring them back to a boil for about 8 minutes. Drain the wings in a colander, and put them on a wire rack to dry. After they’ve cooled a bit, dry them thoroughly with paper towels or a clean kitchen towel. 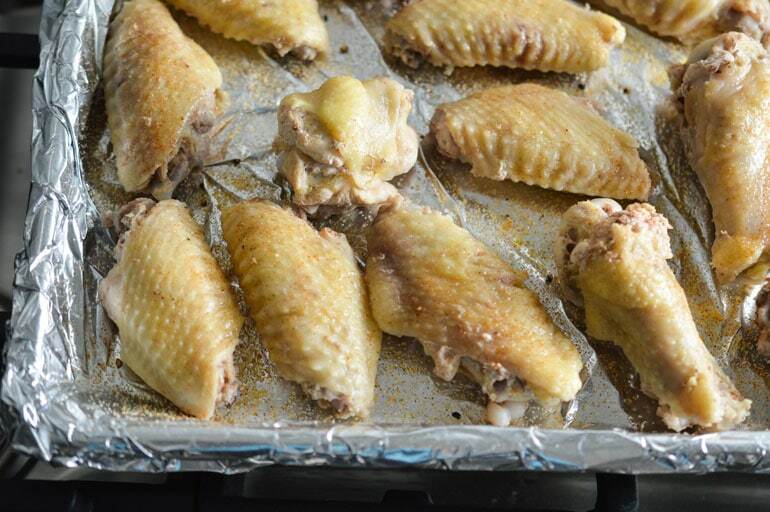 Place the wings on a baking sheet that has been lined with foil and sprayed with cooking spray. Make sure there is air space between them, so they can brown evenly. Sprinkle with your favorite seasoned salt. Bake the wings at 450 degrees for 25 minutes, then flip them over with a rubber spatula and bake another 5-10 minutes until browned and crispy. These wing segments are pretty big, so if you have smaller wing segments you might want to bake them a few minutes less. 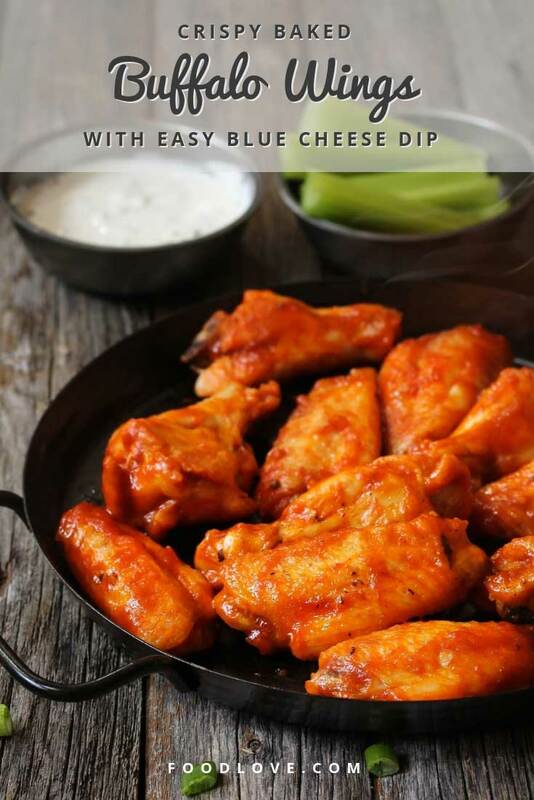 While your crispy baked Buffalo wings are in the oven, you can make the Easy Blue Cheese Dip. Spicy, tangy Buffalo sauce and creamy blue cheese dip are a magic combination, in my opinion. I know blue cheese isn’t everyone’s thing, though, so if you want you can skip the dip or use my recipe for Easy Ranch Dip. 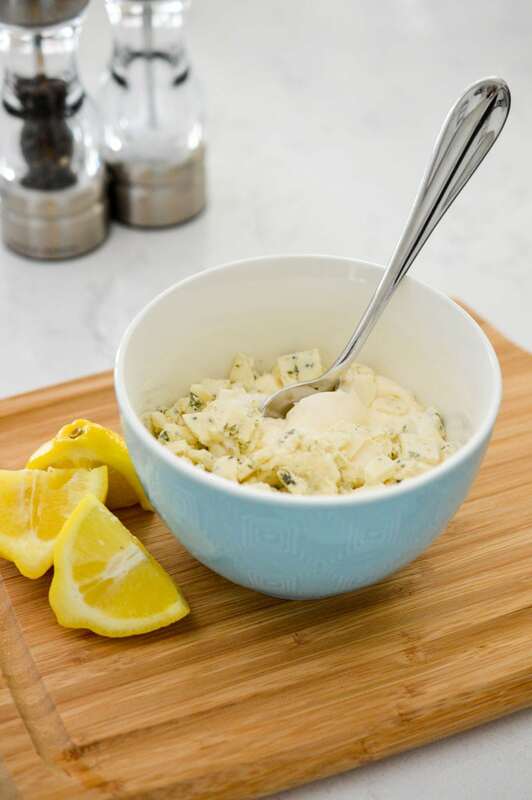 Make the blue cheese dip by stirring together mayonnaise, sour cream, blue cheese crumbles, lemon juice, salt and pepper. That’s all there is to it! While the wings are baking, you can also make the Buffalo sauce, by combining melted butter, Frank’s hot sauce and a dash of Worcestershire sauce. After baking, the wings should be browned and crispy, with no messy deep frying! I stick with tradition and serve the wings with blue cheese dip, carrot sticks and celery sticks. 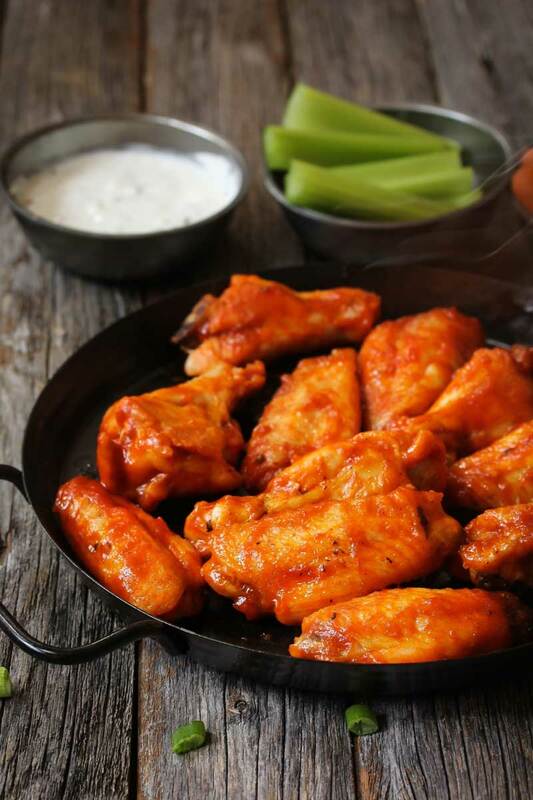 These crispy baked Buffalo wings are so yummy, you’ll want to make them all year long! 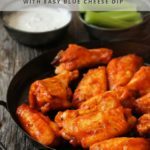 You'll love these easy Baked Buffalo Wings - better than restaurant wings and no deep frying required! Perfect for your Game Day party or simple family dinner. Make the blue cheese dip by combining all ingredients in a small mixing bowl. If possible, leave in refrigerator for 1/2 hour or more to allow flavors to blend. Preheat oven to 450 degrees. Prepare a large baking sheet by lining with foil, then spraying with cooking spray. 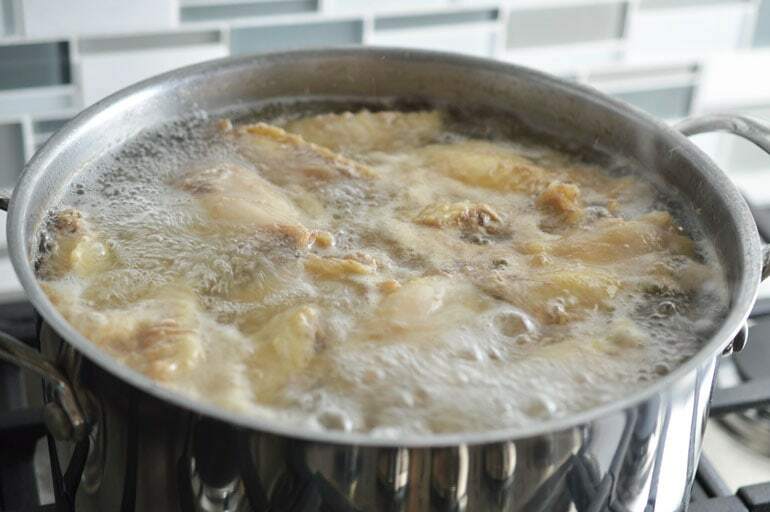 Place the wing segments in boiling salted water, then heat until the water returns to a boil. Continue boiling for about 8 minutes. Drain the wing segments using a colander. Transfer to a wire rack to dry. When the chicken has cooled a bit, finish drying with paper towels. Place the wings on the baking sheet, making sure there is space between them. Bake at 450 degrees for 25 minutes. 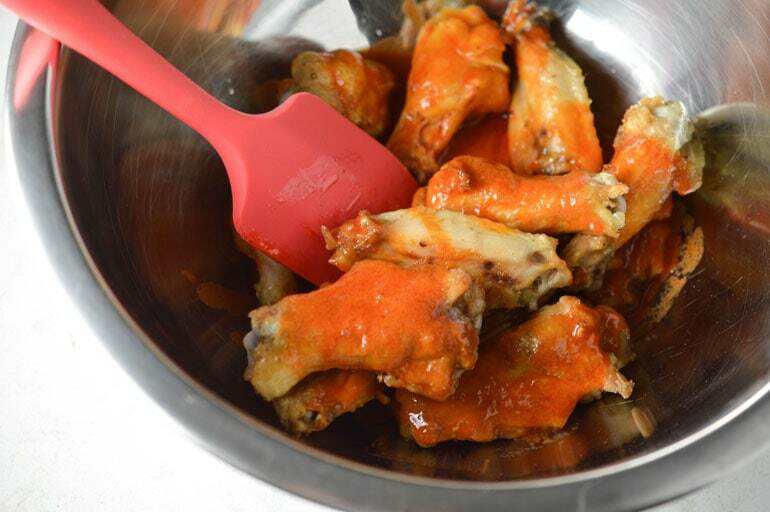 Flip wings with a rubber spatula, then bake an additional 5 minutes. Meanwhile, prepare the sauce by melting the butter in a microwave-safe bowl or measuring cup, then blending with the other ingredients. 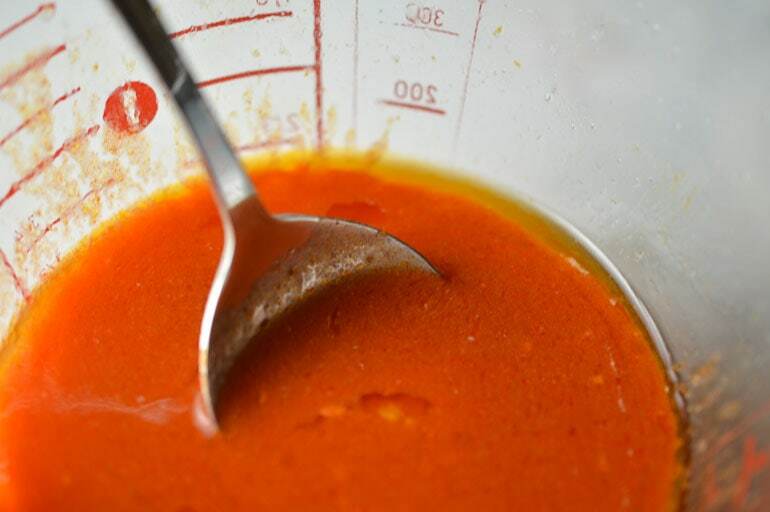 Place the wings in a large mixing bowl, add the sauce and toss until well coated. Serve with celery sticks, carrot sticks and blue cheese dip. Nutrition info is for 1 wing segment with 1 teaspoon Buffalo sauce. One tablespoon dip adds 60 calories, 6g fat, 0g carbohydrate, 1g protein. Photos by Marsha Maxwell and vm2002/Shutterstock.com.